Introduction to understanding, speaking, reading and writing Japanese. After this class students should be able to communicate basic personal information about themselves, family members, friends, and school. Children will be engaged in simple conversations in order to communicate with a Japanese friend; introduce themselves, ask about others, ask questions about the meaning or translation of Japanese words, and invite someone to various activities such as shopping and eating out in Japanese. Children will engage in class through Japanese songs, games, short videos, utilizing computers, and writing/speaking Japanese. A special emphasis will be put on mastering Hiragana, Katakana, some Kanji, as well as basic communicative skills. Materials: Please have your child/children bring notebook, binder (to store materials), and pencils. 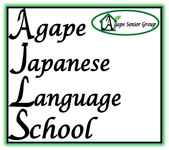 Agape Japanese Language School will provide rest of the materials. Please register as early as possible to make sure we have space availability. We accept payment for check, cash, and Credit Card/Debit Card. Please be advised all card payments will have $0.75 fee applied. If your child has never registered at our Japanese Language School, A new student Japanese Language registration form is required to register in any of our classes (this form is required only if your child has not taken our classes previously). There is a one time registration fee of $25 per child, 10% Discount available for siblings. Please see below for the Japanese Language School registration form for new students.